Bri Ribaj: Google in Second Place? In Japan, Google apparently comes second. Second. I wonder which server gets used as a transitive verb in Japan. I will make sure to ask some of my native Japanese friends to get some answers. The Times has an interested feature today on the topic. 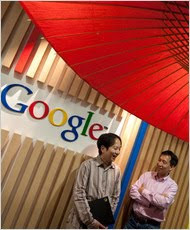 So just who is it that's beating Google in Japan? Yahoo Japan. "“Yahoo Japan is a Japanese company, and most of their employees are Japanese people who fluently understand how the Japanese mind-set and business work,” said Nobuyuki Hayashi, a technology analyst. “But Google’s still a foreigner who’s learned how to speak some Japanese.”"